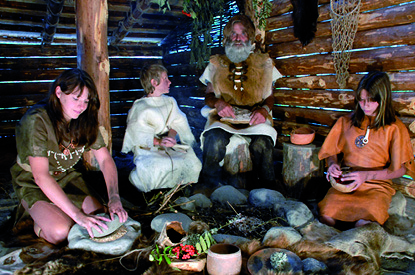 The Ötzi Village opened in 2000, das just 10 years after the historically monumental discovery of Ötzidem “Man in ice“ on Tisenjoch (Ötztaler Alps). 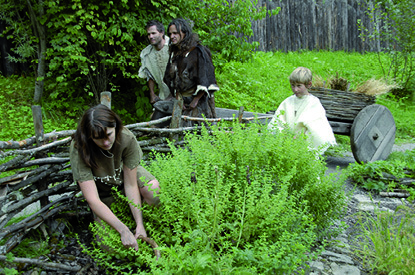 Since then, the archaeological open-air park has been expanded annually. The original area of approximately ca. 4.000 m² has been auf ca.extended to approximately 12.000 m². 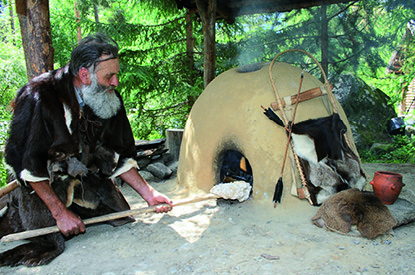 The Ötzi Village attracts around 50,000 guests every year,people of all ages and nationality’s making it one of the most popular destinations in Ötztal. 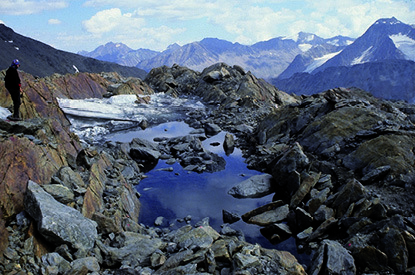 Until the time of Ötzi’s discovery in 1991, Ötztal was on a archaeological level ‘undeveloped’. As a result of the find, research was intensified and as so, have come to prove that the earliest human habitation in this area dates back as early as 8000 BCE. Chr. 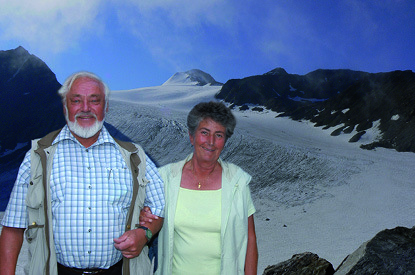 On the 19th of September 1991, two German hikers Erika and Helmut Simon from Nürnberg coincidently, came across the glacier mummy on Tilsenjoch (3.208m) in the Ötztaler Alps. The site is a rocky outcrop and was covered by glacial ice, but as wonders would have it the corpse was well preserved over the thousands of years. Only through the retreat of the glacier and strong defrosting in the unusually hot summer of 1991, was the mummy uncovered. Four days after the discovery, the corpse was retrieved by the Institute of Forensic Medicine from the University of Innsbruck. Å team of Scientists soon confirmed the cultural and historical sensation: The mummy is approximately 5,250 years old, a male from the late Neolithic period. The mummy’s nickname ‘Ötzi’, comes from its place of discovery, the name was quickly a phrase. The mummy has numerous blue-black tattoos that formed short lines. Coal dust was rubbed into small puncture wounds. The ice man had 61 tattoos. Currently these are the oldest tattoos on record. The mummy has numerous blue-black tattoos. Coal dust was rubbed into small puncture wounds. Alltogether 61 tattoos were counted, most to be found on his arms and legs. Currently these are the oldest tattoos on record. The last days of Ötzi’s life were possible to reconstruct through analysis of intestinal contents. Various plant pollen indicate that Ötzi travelled long distances amongst different vegetation zones before his death. Cut injuries to the arm and hands encourage the idea the he was in close combat. About a hour before his death he took a rest and ate a hearty meal. It was found out that the cause of death was a traumatic brain injury and due to an arrow wound on his sholder a large loss of blood. 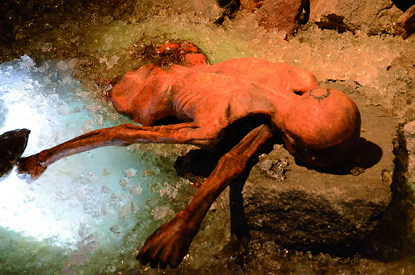 It was not just a naked body that was found, Ötzi was clothed and had numerous everyday objects near him. His jacket and leggings were made of goatskin or sheepskin – possibly a mixture of both, his belt was from calfskin and his loincloth (knee length) was sheepskin. His shoes were made of cowhide and bearskin and on the underside of the shoe, strips of woven leather were attached, it its now believed to be the oldest shoe sole. The lining of the shoe was made of grass cords, dried sweet grasses all held together by a knoted net.. The shoe was specially adapted to the requirements in high mountain terrain. Ötzi was also wearing a cap made of brown bear skin. Of particular importance is the entrained copper hatchet, the hatchet is completely preserved. The blade is made of 99% copper, probably from south Tucson Ore. Ötzi’s ax is the only hatchet from this era that has survived in this condition. Another thing found was a 182 cm bow made of Yew wood, in the origional case 14 arrows made from Wayfaring tree. Two of the arrows still have their arrowhead made of flint. These were attached and glued with plant fibres and birch sap. Ötzi’s equipment also included a dagger with flint blade and handle of ash. Recent medical research has revealed that the man was severely damaged in the icey conditions. In addition to acute joint pain, he suffered from a worm disease in the intestine he had three gallstones that may have caused colic. An intestinal bacteria in the gastric mucous membrane was probably unpleasant. The most surprising thing to find was that the blood lipids were increased significantly. Vascular Stenosis in the area of the carotid arteries and severe insufficiency of the coronary artery was the result. He was at risk of stroke and a heart attack. By means of DNA analysis Ötzi’s genome could be determined. It was deduced that his maternal ancestors came from the alpine region and are now extinct, while his paternal line was found in close Eastern regions where his roots are still detectable in Central Europe today.